Sorbus® Wine Rack and Glassware Under Cabinet Holder – Holds 6 Bottles and 6 Wine Glasses – My Home Wine Bar ! 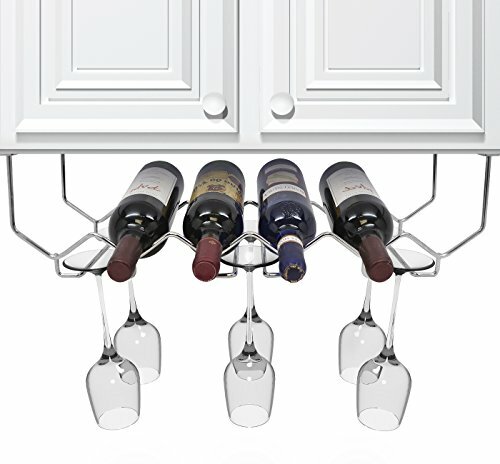 There’s always time for a glass of wine with Sorbus® Wine Rack and Glassware Under Cabinet Holder! This under cabinet rack is the perfect space-saving accessory for any home. The minimalist design accents any décor while creating the most useful and convenient storage. It is uniquely designed to hold each bottle of wine horizontally to keep the corks wet and preserve the taste of the wine longer. At the same time it can hold up to 6 of your most delicate glassware for quick access to a glass of wine after a long day! 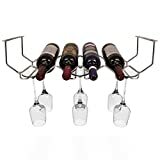 This chic and classic 6-bottle and glassware wine rack is also the perfect gift for the wine lover in your life. It is made of durable construction and strong castings for long-lasting use! Adorn your most prized bottles of wine while creating the most useful and convenient storage! The chrome finish gives a touch of refined elegance while storing your most beloved bottles of wine. This wine rack can be easily cleaned with a dry cloth for lasting quality and years of use. The wall mounted rack also includes matching hardware for easy installation.